What decision point are people at — Some are ready-to-convert, some are researching but persuadable, others are “just looking”. They all have their own personal agenda. Do you know how many of them fit a certain profile? Where do they come from? It’s important to know. Does your landing page work for each decision stage — Unless your targeting is perfect (and chances are it’s not), the same landing page will bring in different kinds of prospects. Each page must therefore “talk” differently to people at different stages in the purchase process. I’ve come to believe that we can learn a lot about how to form and grow relationships with customers by looking at what people do first on a website (particularly in relation to conversion). That first choice people make gives great insight into where they are in the decision process and how they follow through. I’ve been experimenting with data analysis around that “first action taken”. Here are some thoughts and examples and I’d love to hear your thoughts as well. Do people convert early or late in a visit? Landing pages are great for this sort of analysis. They’re usually entry points (because that’s where you’re driving traffic to) and many incorporate the same building blocks — copy, call to action and the Form. Since any page with a form could potentially trigger conversion, it makes sense to analyse when conversion happens. Do people convert as soon as they hit the page or later in the visit? The “detours” people take before conversion tell you what content assists conversion but may be missing from the landing page. It could be content that convinces, explains or reassures. Either way, this gives you a wealth of copy-related hypotheses to power your next iteration. Focus on this first. What mix of decision stages do channels and campaigns bring in? It really does impact how you measure their success at a visit AND visitor level. Focus on cost per lead acquired (i.e. person) if you’re not doing that already. You may need visitor-level tracking for this. Monitor progression rate to next decision stage and time to conversion using cohort analysis (this really helps to understand the customer lifecycle). Struck gold and found a traffic source that brings ready-to-buy new visitors. Double down on that channel if the acquisition numbers work out. Done most of the persuasion in previous visits and people simply come back to complete the final step. So you have a multi-touch conversion journey. Time to obsess less about closing the sale in one step and work to “hook” people who aren’t ready to fill that form. So how do you do this sort of analysis in Google Analytics? There are many factors that affect how you do this sort of behavioural analysis — things like industry, business model, complexity of purchase, site architecture all have an impact. But this next example provides some of the building blocks to get you thinking about visitor flow analysis in terms of decision journey. Almost every single landing page on this website pushes for conversion immediately and aggresively. Conversion goal is filling a form. When people fill it, they’re taken to a confirmation page. This is tracked as a pageview in Google Analytics. I’ll be looking at other examples over the next few weeks to validate whether this logic applies to other industries, business models and use cases. If you have any examples, then please mention them in the comments, especially if they disprove this logic. Second Page Path (or second page visited) is one of my favourite dimensions to use in data analysis. Sadly, it’s only available in the Google Analytics API and not in the user interface (if you’re not using the API you should, right now). You could use the Visitor Flow feature but that’s cumbersome for getting any high level view of data without special profile filters in place. Although it’s a page-type dimension, the second page visited is actually a visit-level dimension in GA, in the same way that Landing Page Path is. This is important because you can tie it back to source, campaign and goal information in a way that you simply cannot with page-level dimensions. Create and compare segments that only include landing pages with the form. This is important because you want to remove any bias created by physical distance between entry point and conversion point. The segments include only visits with conversions. The logic is that if we understand the behaviour of people who do convert, we can then apply those learnings to improve conversions across the board. 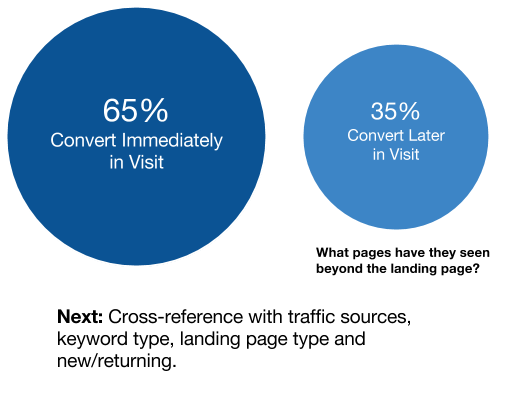 In our case, around 65% of conversions occured immediately and 35% occured later in the visit. This meant we had to drill into both segments for more clarity around the customer behaviour. What other content have people looked at before converting? What kind? Is that content already on the landing pages? How prominent is it? What decision stage would someone likely be if they need that information before converting? Are there any significant differences between audience interests? We discovered that most people took a detour to admissions, student services and faculty information (there was hardly any reference to these topics on the course landing pages), particularly for some disciplines. We discovered that PhD and Masters-level audiences coming from search needed significantly more information (and of a particular kind) to assist with the decision process compared to other audiences. This sort of information gave us great insight into how to optimise campaign targeting and maintain scent through to landing page and beyond. People often take detours from the well-crafted conversion path you’ve designed for them. Drill into what happens during these detours and cross-reference with where people come from and what they’re interested in. Use the insights to formulate future hypotheses around landing pages, their design and role, as well as around campaigns optimisation. Do you analyse detours from landing pages for insight into behaviour or are A/B test results enough? Please leave a comment below with your thoughts.